HENLEY Rugby Club have officially unveiled their new £450,000 changing rooms. The development is the second phase of a project to transform the club’s facilities at Dry Leas, off Marlow Road. The first phase was the refurbishment of the adjoining clubhouse. A single-storey extension on the western side of the clubhouse provides two changing rooms, a physiotherapy room and toilets that meet Rugby Football Union standards as well as the club shop. The official opening ceremony took place on Friday evening with a drinks reception attended by more than 100 people. Henley Mayor Kellie Hinton and Jeannette Matelot, chairwoman of South Oxfordshire District Council, cut the ribbon. Both the district council and Henley Town Council contributed towards the cost of the redevelopment. The reception was followed by a three-course dinner to thank former club chairman Mike Trethewey, who led the club’s fund-raising campaign, before he stepped down in May after four years. Chris Nixon, who has taken over as chairman, said: “We are delighted that the second phase of our clubhouse redevelopment is now complete. raising and all who have helped make such a superb facility a reality. “It’s a very proud moment — it has taken three years to get to where we are now completing the clubhouse and changing room extension. Mr Nixon said the facility would benefit all the club’s teams, from the seniors to the mini and junior sections. Director of rugby Nigel Dudding said: “We have always wanted to have the best facilities and from our point of view it helps enormously when you’re trying to recruit players. Mr Trethewey said: “What we did as a club was fantastic. If you take the changing rooms and clubhouse, we raised just over £1 million. Other dignitaries present included RFU chief executive Steve Brown, Oxfordshire RFU chairman Chris Skaife and England women’s world cup finalist and former Hawks player Tamara Taylor. The club received a grant of £100,000 from both the town council and the district council. 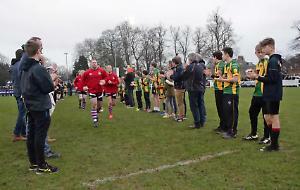 It also received a £100,000 loan from both the town council and the RFU. The project was also supported by the Trust for Oxfordshire Environment and Grundon Waste Management through the Landfill Communities Fund. About 40 per cent was contributed by members of the club. The club’s old changing rooms, gym, treatment room and offices were in a separate building to the east of the clubhouse and the new facility means players are closer to the pitch when they exit the changing room.